Freezing season has started, or has it? The unusually cold winter this year in China may be a result of the record loss of Arctic sea ice this summer, Chen Yu, senior engineer of the National Climate Center, told China Daily on Friday. According to the National Snow and Ice Data Center in the United States, Arctic sea ice shrank to a record low on Sept 16, to an average total area of 3.61 million square kilometers. "Observation and data analysis showed that Arctic sea ice loss may cause cold and snowy winters in parts of Asia," Chen said. She explained that when sea ice melts in the Arctic, the water temperature increases. When that happens, the air becomes moister and is more likely to form cold fronts. According to the China Meteorological Administration, in December most of China suffered colder weather than usual. On Dec 24, frequent cold fronts led to temperatures in 21 monitoring stations hitting record lows. And the cold weather is going to return. A new round of cold fronts will hit most parts of the country on New Year's Eve, bringing mild to medium snowfalls to Northeast China. Kang Zhiming, weather forecaster of the National Meteorological Center, said weather models showed the temperature will not rise until late January. "The weather authorities will keep a close eye on any changes in the weather, especially before Spring Festival, in order to give timely information to transport and related departments, particularly in the event of extreme weather," Kang said. A cold front has descended on many provincial capitals, with temperatures in some cases hitting well below -20 C, while temperatures in parts of central and eastern areas are predicted to hit record lows, the National Meteorological Center said. The cold spell has claimed lives and led to calls for public buildings to conserve energy to ensure heating for residential areas. Temperatures dropped sharply overnight in the north, the Inner Mongolia autonomous region, Fujian and Guangdong provinces, Xinhua News Agency reported. Many areas experienced the lowest temperatures so far this winter, including parts of the Xinjiang Uygur autonomous region, Shandong, Yunnan, Guizhou, Hubei, Hunan, Fujian, Guangdong and Hainan provinces. Some areas in Inner Mongolia witnessed the mercury falling to -40 C on Saturday and Sunday. Highways in Yantai, a coastal city in Shandong province, were temporarily closed on Sunday due to heavy snow. Heavy snow will continue hitting northeastern parts of Shandong province and northwestern parts of Xinjiang through Sunday and Monday. The lowest temperature recorded in Harbin, Heilongjiang province, was -29 C on Sunday, not much colder than the highest of -22 C. Tuesday is predicted to be the coldest day, when the thermometer is expected to record -33 C.
In the neighboring province of Jilin, the lowest temperatures in the cities of Changchun, Liaoyuan, Tonghua and Baishan could also plunge to -33 C on Tuesday, the center said. The average temperature in Jilin this winter has been -24 C, 11 to 14 degrees lower than in other years. There's more. Read the rest of the article here. If there was so much cold over Russia and China in the past two weeks, where did all the heat go? Whereas the Central Arctic was very cold for a couple of days, temps have been anomalously high over Baffin Bay and the Canadian Archipelago, and of course between Svalbard and Novaya Zemlya. Luckily winter is still long, otherwise a record early opening of the Northwest Passage would've been a done deal. One of many consequences of the China cold snap is that steel reinforcement- bar futures fell from a five-month high, according to Bloomberg. This will make it easier to construct ghost towns and phantom malls that boost economic growth. And don't forget: ghost towns don't require much heating. Polar Research Institute of China Deputy Director Li Bingrui said the new shipping routes created by the melting ice will cut shipping costs between Europe and Asia. The receding of the ice cap surrounding the North Pole could open up three routes - the Northwest Passage, crossing the Canadian Arctic; the Northeast Passage, running from Murmansk, Russia, to the Bering Strait; and the Central Arctic Shipping Route, which will run through the North Pole. Many believe the Central Arctic Shipping Route is the most feasible Arctic shipping route. It is the shortest way through the central Arctic Ocean, the passage through which depends on dramatic reductions of North Pole ice thickness. Scientists predict that, if the sea ice continues to melt, icebreakers could navigate central Arctic waters before 2020. The Russians own the Northern Sea Route, so we have to think big. "... the Chinese are eyeing a new shipping route through the Arctic"
The problem is that everybody's eyeing an open Arctic shipping opportunity. And that's when it becomes a whole new game: economy will (start to) rely on an open Arctic and when there's a fluke year of a more closed one there'll be economic backlash due to higher transport costs. Also: any info of how the high over the Canadian Archipelago will affect to ongoing drought in the U.S.? In addition to shipping, there is also the question of aviation. IIRC, up until 1998, there was essentially no commercial air traffic over the Arctic, as Russia would not allow its passage though Russian air space. There are now over 50,000 commercial flights per year. If all of these flights are depositing water vapour, a significant greenhouse gas, at altitude in the Arctic atmosphere, could this be a significant forcing? Want to slow Arctic melting? Stop flying over the North Pole. But that's about the effect of black carbon emitted through cross-polar aviation, not about water vapour/contrails. If flights were to be diverted, would a lack of water vapour cause less clouds and thus more insolation? I know for example from the BBC Global Dimming documentary that temps increased across the US due to the ban on flying right after 9/11. No contrails caused more sunlight to reach the surface. A Magadan in the Russian Far East, several schools were closed because of the cold. Even southern Russia has been hit by the cold snap. Thus, the operation of the airport in Makhachkala, capital of Dagestan Republic of the Russian Caucasus bordered by the Caspian Sea, has been disrupted due to heavy snowfall and twenty flights have been delayed. Six people died and over 220 were injured in the past 24 hours. In Poland, the situation does not improve. In Warsaw, there had been a few inches of snow. Temperatures range between -5 and -10C, even to -20C in parts of the East. In Lithuania, the blizzard and snow rage these days, causing many roads cut across the country. Ukraine: Nineteen people died of cold in the last 24 hours in Ukraine where temperatures dipped below -20C in some areas to 37 death toll in the country since the beginning of the month. In addition, 190 people were rescued for hypothermia and frostbite, of which 162 were hospitalized. Ukraine is affected by several weeks of heavy snow which was added in recent days a cold wave glacial. Le mercury dropped to -12 to -16C in the center and south of the country and up -23C in the Lugansk region (east). The Ministry of Emergency Situations said Monday it has already opened more than 200 aid stations across the country. You can warm up and get a hot meal. Temperatures are in the range of -15 to -17C in the country. 21/12: The freezing temperatures that have hit Russia have caused the death of two more people in 24 hours, bringing the total wave of cold 56 dead in a week. In the last 24 hours, 153 people were victims of the gel, 58 were taken to hospital and two died, according to a medical source. In total, since the beginning of the cold wave, 371 people were hospitalized and 56 died. Since 14 December, temperatures drop below -20C in Moscow and near -50C in parts of Siberia. Meteorological services expect the cold spell will last until early next week. In Poland, this new wave of cold that killed 19 bears and forty-nine people died of cold since December 1 in Poland where temperatures have recently declined to -10C with snow. Vacation is starting early for 487 schools in Bulgaria, as they were all forced to close Friday due to the severe winter weather. 93 of the schools in question were closed due to hazardous road conditions, while the rest were forced to close over the severe weather. Schools were closed in Burgas (50 schools), Varna (129 schools), Dobrich (83 schools), Razgrad (48 schools), Ruse (8 schools), Silistra (48 schools), Sliven (28 schools), Targovishte (21 schools), Shumen (71 schools) and Yambol (1 school). The blizzards that have paralyzed Eastern Bulgaria in the past couple of days have led the authorities to close sections of major roads and highways on Friday. Inclement winter weather caused emergency situations in 12 municipalities in Eastern Bulgaria. 24/12: A deadly cold snap has claimed 88 lives across Russia, officials said Sunday, as Moscow authorities told schoolchildren they could stay home to avoid the frigid temperatures. Temperatures across the capital region were expected to drop to almost -30C (minus 22 Fahrenheit) in the night. Aside from the 88 people who have perished, another 538 people needed hospital treatment, Russian news agency Ria Novosti said, citing a medical source. The agency said seven people, including a child, had died in the past 24 hours. An official with Moscow's education department told the Interfax news agency that younger children could stay home on Monday. Russia has been in the grips of an intense and unseasonable chill for the past 10 days or so. Temperatures have fallen to below -50C in eastern Siberia, and -20C in Moscow. The temperatures are 12C lower than seasonal norms, with such chills not normally arriving until January or February. The vicious cold snap has also claimed lives across eastern Europe. Authorities in Ukraine, which has been battling heavy snowfall for weeks, said Friday that 83 people had died of cold, with 57 of the victims found on the street. Russian weather services, however, are expecting a warming later in the week. 25/12: Russia is in the icy grip of its coldest December on record. In Siberia, to the east, temperatures have plummeted to almost minus -60°C. In Magadan region, dozens of heavy vehicles have been trying unblock around 300km of roads covered by snow. In Tyva region, heating pipes have burst, meaning more than 3,000 people had to be evacuated. This cold snap has reportedly killed 123 people including seven in the last 24 hours. Emergency services have organised evacuation points in schools and hospitals. Emergency workers are trying to fix burst pipelines to restore heating while local authorities sent a plane with heaters and electric generators. On the other hand, unseasonable warmth came to Western Europe. Merrymakers hoping for a White Christmas were disappointed in Germany and some parts of Europe this week as a low-pressure front created record-high holiday temperatures. Beer gardens reopened and bathers flocked to nearby lakes. The German weather service recorded some of the highest temperatures ever for Christmas Eve in the country on Monday, with news agencies describing it as weather suitable for driving a convertible car. In Munich, beer gardens reopened to offer Christmas brews and cheers, and in one Bavarian lake swimmers could be seen splashing around amidst 20-degree Celsius (68-degrees Fahrenheit) temperatures. Street cafés in many parts of the country overflowed with guests. On Christmas Day itself, temperatures in Berlin reached 12.7 degrees, the highest on the holiday ever recorded since the German Weather Service began tracking such data in 1876. Unseasonably warm weather also meant massive snow melt in parts of the country, putting a damper on winter sports in the Harz mountains and parts of the Alps in Bavaria, with many ski resorts closing down their lifts. The melt also created problems along the Rhine River, where ferry services were terminated in some towns because of rising water levels. In Cologne, officials erected flood barriers as a precautionary measure, although river levels never rose to the point that they threatened the city's old town. Officials also reported rising levels on other German rivers. On Thursday, rainfall led river levels to rise again. A low-pressure front has ensured unseasonably mild temperatures across Germany, and weather forecasters say it is unlikely that winter weather will return anywhere but in the mountains before the New Year. This Christmas proved to be one of weather extremes across Europe. In neighboring France, summer-like temperatures of 24.3 degrees drew holiday goers out to the beaches. Yes, that article is the one that provoked my train of thought. Just based on layman's hunch, I would have thought that water vapour would be more significant than black carbon. Clear winter nights are noticeably colder than cloudy ones. If the grounding of aircraft after 9/11 was sufficient to impact on temperatures, that is further grist to my mill. And contrails can't block incoming sunlight during the polar night; but they could affect outgoing radiation. A Very Merry Season to All! "She explained that when sea ice melts in the Arctic, the water temperature increases. When that happens, the air becomes moister and is more likely to form cold fronts." Is anyone aware of a graph that tracks atmospheric moisture content in the Arctic? It's undoubtedly gone up considerably as the ice has retreated and I'd be interested in tracking the seasonal as well as the multi-year changes. >"I know for example from the BBC Global Dimming documentary that temps increased across the US due to the ban on flying right after 9/11. No contrails caused more sunlight to reach the surface." There was no attempt made to measure temperature increase effect. Any such effect would be less than the measurement error. There was a graph showing a 2C increase but I believe this was of an increase in differences between max and min temperatures. Contrails/clouds cool daytime and warm nightime. So should the message be fly over arctic in spring and summer but not in autumn & winter? Humidity levels adjust rapidly in lower troposphere (~11 days) but the stratosphere is rather dry and there is little mixing so water presumably stays rather longer in stratosphere so perhaps the water vapour GHG effect can be affected. Does the water tend to remove dust from stratosphere that would otherwise scatter solar radiation? The contrails paper was Travis et al, 2002, "Regional Variations in U.S. Diurnal Temperature Range for the 11–14 September 2001 Aircraft Groundings: Evidence of Jet Contrail Influence on Climate." Can't find a paywall free copy. However there have been several papers that have questioned the conclusion of that paper. For example Hong et al, 2008, "Do contrails significantly reduce daily temperature range?" Which finds that the change in DTR was due to low cloud, not high cloud. They conclude that high clouds have very little effect on DTR. Also Dietmuller et al 2008, "Contrails, Natural Clouds, and Diurnal Temperature Range", finds that the claim of reduced DTR 'lacks statistical backing'. Just found a 'brief communication' of Travis 2002, which is probably more readable for most here than the original scientific paper. I can't help but I dislike the attribuition of any event, be it a storm or a winter, may it have soandso many people killed, be they as improbable as it may be, to global warming. It all sounds sensational and interesting, but under the bottom line I only trust statistics. There have been harsh and early winters before in Russia, e.g. the one that helped keep the German Army 1941 from taking Moscow. Neven: Where did all that heat go? When a blocked winter high forms in a continental region, then no additional moisture can be transported into the area, all the moisture condenses out, so the heat radiates into space, and it gets cold. Such blocked highs are more common in a time of global warming. It is worth remembering that when we had intact sea ice, we would get very dry air masses coming down out of the Arctic. These also allowed heat to radiate out, producing real and sustained cold. 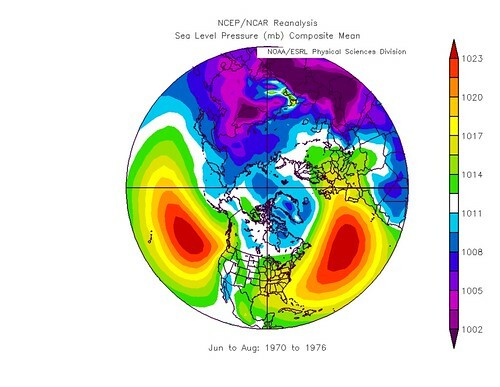 What we are seeing now in Russia, Siberia, and China is cold compared to the last 50 years, but is not particularly cold compared to what was common 150 years ago. My expectation is more blocked continental highs; resulting in more of this kind of cold spell event in the winter, and very hot dry spells events in the summer. Terry; It has gotten moister in the Arctic. In 1970, there were still Greenlanders that had never seen rain. In the last 12 years, it has rained at all of the Greenland settlements where children live. I think some sort of a graphic of the increasing moisture in Arctic atmosphere would be useful. Something that combines both temperature and RH for the total Gibbs heat would be even better. A little birdy tells me that contrails can be ice crystals, water droplets, or some kind of mud full of particles of incomplete combustion and sulfates. Each of these would have somewhat different effects. Birdy says that fuel, engine type, altitude, and local weather matter. Any idea if the extended negative Arctic Oscillation is playing a role in the observed cold weather? I've got to say that we're having the coldest late fall/early winter here in my part of the PNW that I recall during the last 20 years. We had snow in October and again in November when we would normally get warm rain. I've been snowed in for over two weeks (going to have to hire a cat soon). That has never happened before Christmas before. And the storms we've had have been unusually windy. For sure today's weirdness is one of it's results. Look at the ice pushed through the Fram strait and now piling up at the Northern cost of Iceland. Meanwhile, and as it had been put already by Apocalyps, here in Western Europe temperares remain unseasonable high. And weather will stay like that at least till 7 January. Fitting the weather weirdness category, a new article on the Great Arctic Storm of August 2012 argues that it was not caused by heat exchange with open Artic Ocean water or higher SST's. 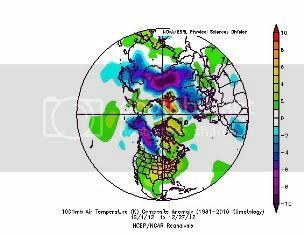 See "Great Arctic Cyclone of 2012 really was impressive"
it offered no diversion as similar to December 2010. The December pattern on 500Mb has generally supported a ‘round-up’ of cold in the places discussed above. Far (-5dC) below average temps have been present over app. 12 million km2 in Northern Asia (axis Beijing – Aral Lake), Northern Europe (axis Bothnian Gulf – Onega Lake) and Northern America (axis central/west Alaska – Saskatchewan). Contrary were Far (+5dC) above average temps over app. 5 million km2 on the Atlantic side of the Arctic (axis fram Strait – Yenisej estuary), Northwest Greenland, Hudson Strait and the North part of central USA. Together, they match up to a rather cold NH winter month. But with anomalous geographical distribution. I would say the ‘Atlantification’ of the Barentsz- and Kara Seas is in full progress, exceptional early winter snowfall contributed to equal radiation of warmth in the above mentioned continental swaths. 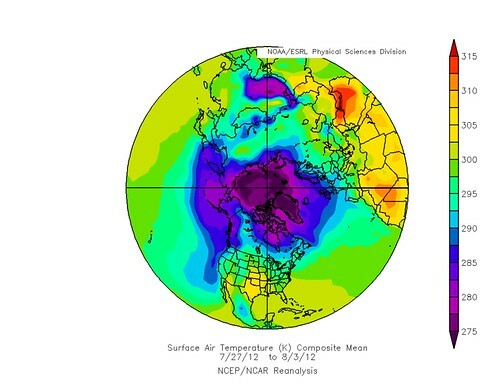 It is not explicitly what is called ‘cold continent – warm arctic’; coinciding with the Lomonosov Ridge, there was a part of the Central Arctic Basin up to 3dC colder than the climo. To extend this into any opinion of the ‘State of Global Warming’, keep in mind that a large part of the above mentioned cold areas were exceptionally warm well into September and October. This GISS map gives some perspective. A quick characterization of this could be: high GHG-gas output on the NH contributed to ongoing temperature rise and somehow disproportionate distribution between Arctic and Antarctic regions. Let’s keep in mind that this is atmosphere. It tells us nothing on redistribution of warmth in the oceans. I wish you all a very happy new years wake with your loved ones and hope together we'll find a way to cope with futures challenges! Cyclones are internal work, and it takes energy to drive them. doi:10.1029/2012GL054259 makes a point of not saying where the energy came from. They say it did not come heat in the ocean, but do not go out on a limb and tell us where the energy did come from. "Cyclones are internal work, and it takes energy to drive them. doi:10.1029/2012GL054259 makes a point of not saying where the energy came from." Er, don't they find the energy came from the tropopause vortex? "Together, they match up to a rather cold NH winter month. But with anomalous geographical distribution." It is an odd distribution. I'm betting it's mainly a Cohen type event, due to the low AO, with complication from the low Barents ice adding to the setup over Eurasia. Over America the lack of cold into the bulk of the US is odd, and not typical of low AO cold pattern - not sure why this is. Of course, it is anomaly in vector winds. Not that it's been windy out of the same direction all the time. But the US experiences anomalous input from the Atlantic, isn't it? There are so many scientists saying - "We do not know" when it comes to current weather and climate patterns. The most recent was this week, when projecting future snow forecasting for North America and the 3 month outlook. "Doesken said the forecast for the first part of 2013 doesn't include much moisture, and the longer range outlook is uncertain. Conditions in the Pacific Ocean determine some long-distance weather patterns, which in turn affect snowfall in the West. So far, the Pacific has yielded few clues about those patterns, Doesken told the AP. "It doesn't bode snowy, it doesn't bode drought. It doesn't bode average, either. It just bodes 'We don't know,'"
For sure, I just have learned through Neven's blog...but I am merely gazing at the light, to use Plato's cave-allegory. But using CPC ENSO reports etcetera, I'm not surprised the climatologist you mention admits he has no clue. While ENSO is ambiguous and AO is flipping on a months' rhytm, it is impossible to say where and when anything is going to hurt. On a related note: anyone know what to tell a 6 year old who just saw on the news that the location of Santa's factory is now an ocean? I'd like to know whether parents have reached consensus on a plot twist in this lie. Still playing catch-up here. 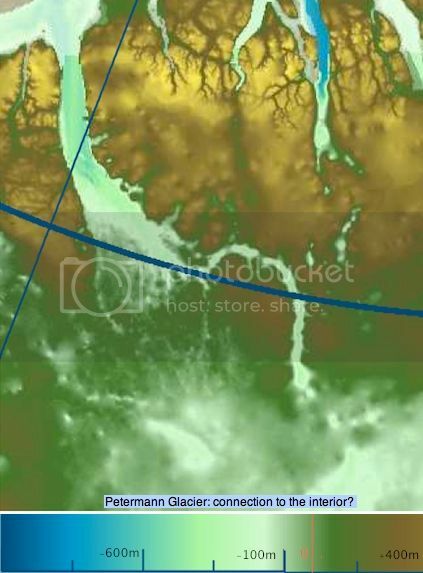 Several people have asked if the bedrock map of Greenland has been updated since Bamber 2001. Yes indeed, Griggs 2013 will appear next week in final form, free full text below. The interior area below sea level has been corrected to 22% but consider too actual track coverage the error map (Fig.7). Much, but not all, of this is warmed by the (highly variable) geothermal gradient to a temperature where the pressure from above does not allow ice. The resolution is immensely better in near-coastal regions (below, for Jakobshavn Isbrae). I enlarged Petermann glacier to the max (also below). With Petermann, the interest is in the main sill, secondary sills if any, currents cutting channels in the underside, the nature of the grounding line (gravelly sediment or precambrian bedrock), fjord overdeeping behind the hinge, and the connection if any to the main below-sea level interior. These issues are still not fully resolved even by dedicated flights; a submarine visit in the works next season could resolve down-fjord issues. I just have to wonder what happens when the Petermann melts back enough for ocean water to get past the grounding line and connect with this large and deep pool of water, which may be augmented shortly by moulin drainage from higher elevation melt ponds (which are perfectly capable of drilling a couple of km straight down). A giant floating ice cube? While this is an excellent article in many respects, the cartography products are unsatisfactory (as they often are in climate science). The color palettes are terrible, layers were flattened in the wrong sequence, no kmz, and nothing useful is supplied in supplemental -- not even the core map at measurement resolution. Do we need lat/long lines masking data? 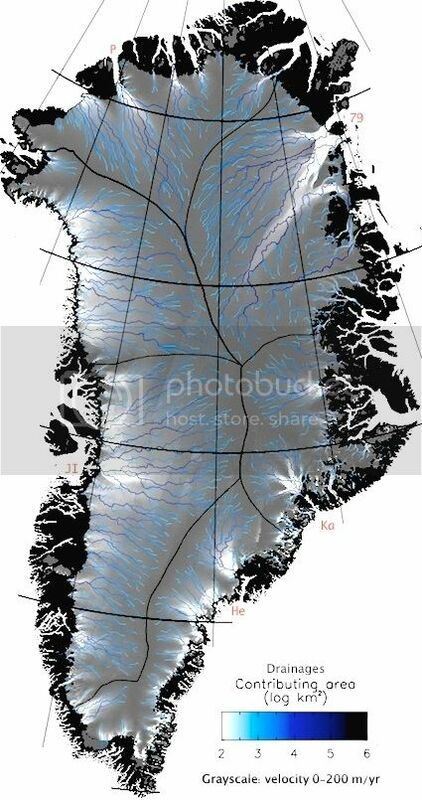 -- surely readers of The Cryosphere know where Greenland is located. Evidently 10k readers have to purchase 10k copies of mapping software, dive into yet another raw data format 10k times, guess at the projection, and produce the map that reviewers should have required in the first place. Then go through it all again with some other layer they need to co-register. GIS = geographical information system. 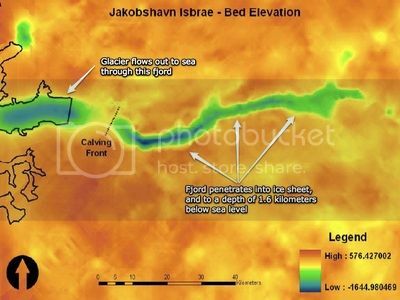 Here are some other very recent articles, free full text around, that go with the above Greenland post. 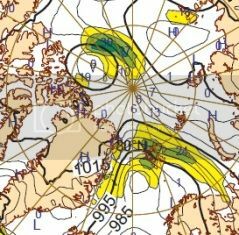 My article somehow didn't show up, problem fixed, http://eh2r.blogspot.ca/ shows a net migration of the jet stream Northwards and also towards Greenland, making it wet and soggy for the UK and Ireland. If it were another re-run of 2009/10, it would be boring and after noting it I'd have little else to say. It's the ambiguity that makes it interesting. As I say, it's just a bet on my part that this is a Cohen pattern, how the winter will play out is uncertain. I've not used Vector Wind before, always use Meridional/Zonal flow plots. I presume that the colouring is related to the wind velocity - in which case I'm afraid I can't tell much from the graphic as the vector arrows aren't legible. Here's zonal flow, negative is clockwise, positive anti-clockwise. The anomalous easterly wind into the US from the Atlantic that's seen in the corresponding anomaly plot is seen in the mean to be a Westerly wind from the US to the Atlantic. The anomalous wind is actually a reduced trade wind, but the trade wind still blows to the east. I got caught out by a similar issue with the Barents low, which appeared on some NCEP/NCAR plots as a high. There's a climatological tendency towards low over there, in fact it's in a swathe from Barents into the Atlantic towards Iceland. What the lack of ice is doing is reducing the strength of that low, giving a high pressure anomaly. The high pressure forms over the land in response to low sea ice. See here - for early February 2012. Current situation shows a ridge of high towards Barents, which is why I see a Pethoukohv Semenov pattern superimposed on a Cohen pattern, but not as strong as early Feb this year. You're arguing that the cold over Greenland is now the prime cold spot as the Arctic ocean air mass has warmed during summer. SLP for three periods to show typical atmospheric set up. It can be seen that the previous SLP configuration was low pressure over the pole, extending to Greenland. In 2007 the configuration shifted to high pressure over the Beaufort CAA sector extending to Greenland, with low pressure over the Siberian sector, setting up an AD configuration over the pole. b) There is high pressure over Beaufort/CAA both of which have warmed markedly. c) That using mean or climo plots of 500mb geopotential height reveals that a ridge over Greenland is part of the long term climatology. What has happened since 2007 is that this ridge has grown much stronger and has induced a pattern of change around it that give rise to the pattern of lows around Greenland. 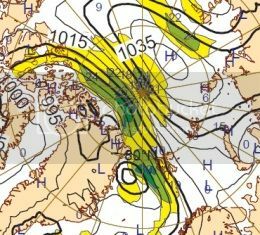 Indeed the UK's wet weather is the southernmost extension of a pattern of lows that ran around the Scandinavian/Russian Arctic coasts, and spawned the August Cyclone. Re: "I just have to wonder what happens when the Petermann melts back enough for ocean water to get past the grounding line and connect with this large and deep pool of water, which may be augmented shortly by moulin drainage from higher elevation melt ponds (which are perfectly capable of drilling a couple of km straight down). A giant floating ice cube?" Werther, Chris, Crandles, and anyone else watching sea ice motion/concentration and thickness at the moment. I have run across an anomaly that has me scratching my head. I have put up the NCOF imagery through November and December, and while looking at the Decemeber 25 concentration and thickness, thought it was a blip in the imagery. However, the anomaly has changed shape and moved from the 21st-28th. On Dec 22 through Dec 28 we had rather large area about 50 miles from 90N that developed no or very low sea ice concentration and no thickness - a hole that at one point was about 85 by 90 miles. I am interested in an explanation, other than the winds and storms that have been lashing the Norwegian and Greenland Seas and strong winds blowing from the south over the Pole. Could be clouds or other atmospheric reflection. Thanks for the response, the NCOF data is not available yet for Dec 29-31, so we will have a closer comparison, perhaps tomorrow. Is the sea ice concentration from satellite, or is it from a model? If it's from a model - where is the grid centred? I've been trying to answer these questions but haven't got anywhere with Google. What I'm thinking is if it's a model with the grid centred on the true north pole then this could feasibly be due to anomalous ice movement over or around the pole. However as this anomaly doesn't occur elsewhere as far as I can see this may well be an explanation that can be discounted. I am a founder member of the No miles high club (Motto: "We promise never to fly until we break our promise") and run the (very limited) No Planes website. This means I want to know how bad (or otherwise) are the effects of aviation on climate - I am already confused afere reading Unger et.al Attribution of climate forcing to economic sectors which suggests that the short-term effects of aviation may be to cool the Earth. Contrails, Natural Clouds, and Diurnal Temperature Range by Dietmüller et.al. Another point questioning the Travis hypothesis is that the decrease in DTR of 1.1 K for 11–13 September 2001 lies within the 99% confidence interval of natural DTR variability, indicating that a 3-day anomaly of the respective magnitude can be largely explained by natural fluctuations. Does this mean that unless an event has a 99% chance of being consistent with a particular theory of ("99 to one on" in horse racing terms) it should not be considered as part of the evidence that "Science" can pass on to policy makers? 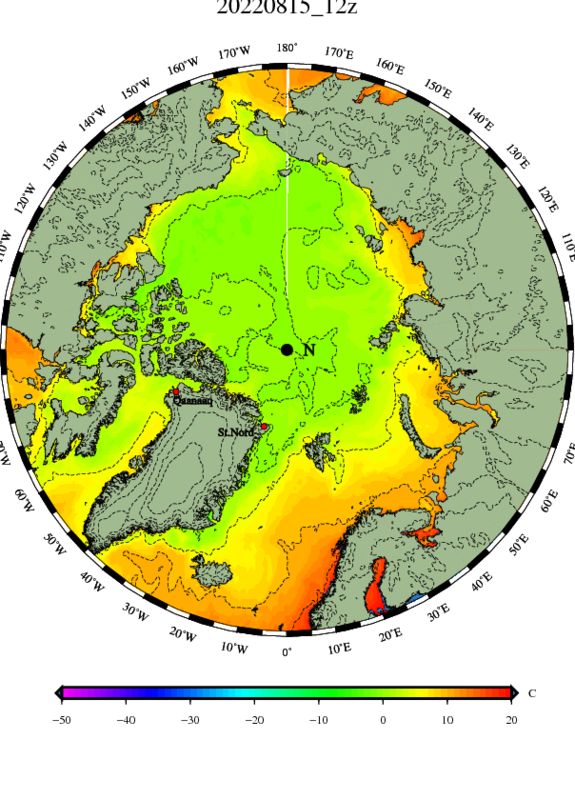 A4R My take on this is that atlantic water has circled the arctic, and was responsible for the early anomoly mid may in mackenzie bay, having established itself it's persisted. It can no longer seep between the sea ice and the continental shelf of the canadian arctic archipelago and broke through to the north of greenland late november early december being responsible for the lifting and shifting of the block of thicker ice set moving, from northeast greenland, then. It's manifest in the blue area [on your sea ice thickness, NCOF,] at 140/75n where it appears there's a persitent sub-surface hot spot, indicating an excess of energy. However going from 75n to 85n it has to shed kinetic energy equivalent to 70m/s 2450kjoules for every m3. That creates a massive amount of EKE/turbulence, and is clearly churning and mixing various layers up to the surface. I did think this may happen earlier [oct? ], but once the freeze set in thought perhaps the break through would wait til early may. Energetically this water would be more comfortable further south and may move to undermine the multi year/thicker ice to the north of greenland. Lets hope it's just an artifact of the model. Thanks to all for the ideas and comments, johnm. I'll look at what you have as soon as I update my websites for 2013. Hi Chris, 5 year SLP means do not describe seasons very well in context of trying to explain a certain event as what I did, I think a shorter term averaging more appropriate to break down a giving year with another. The dipole is a summer 2007 story, quite large and overwhelming, a relatively unique period which may overtake other years displays. Year by year comparisons are more focused and telling. 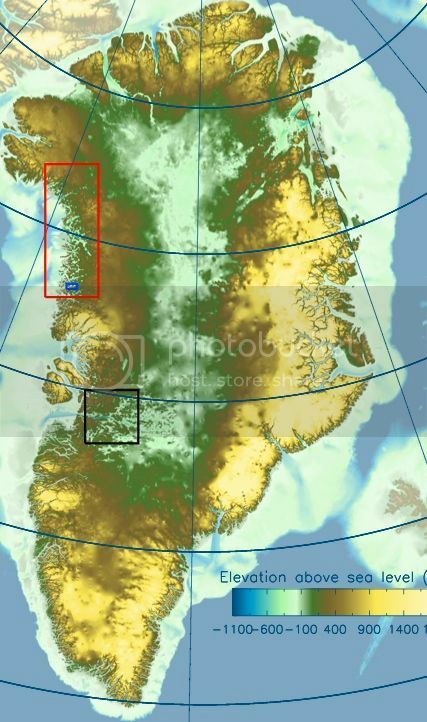 Its simple, Greenland area is the only cool place during summer, what remains of sea ice combined with this big glacier displaces the centre of cold temperature gravity for the rest of the Northern hemisphere to gyrate around. And what drives the tropopause vortex? They are invoking a more diffuse and less bounded system to avoid attributing the circulation pattern to energy flows associated with sea ice loss. The loss of a few million km^2 of sea ice affects everything north of the equator, including the tropopause vortex. A five year average is exactly the sort of thing needed to draw out the pattern from the noise. Use just one year and you're missing out on that power of averaging. You've repeated your claim about Greenland, do you not consider the NCEP/NCAR data and points that I present worth addressing? I showed that the post 2007 change doesn't seem to me to tally with your explanation. The 2007 dipole was just the start, it wasn't even the greatest magnitude dipole anomaly in the 2007 - 2012 period. "And what drives the tropopause vortex?" Ultimately the spin of the Earth. How do you account for heat flux not being great enough to drive the storm? Check out fig 2; at the time of minimum central pressure the sea ice concentration had risen because the storm was over the ice, which doesn't tally with the idea that it was driven by low sea ice and open water. The argument that's often been used here is using analogy with Autumn storms, which feed off the warm water. But that is incomplete. Storms don't feed off temperature, but temperature difference. With the water near air temperatures the resultant heat flux will not be great. NCEP/NCAR shows this, during summer lower troposphere heating from ocean heat flux is small. It is later in Autumn that the cooling of the atmosphere really draws heat from the ocean; the temperature differential between ocean and atmosphere driving the heat flux. I agree that the loss of sea ice has substantial impacts. But it is important to keep the physics at the forefront. Mean Temperature for +/-3days around start of August this year. Over the ice was about 1degC warmer than over the ocean. Plot in Kelvin (K), 1K = 1degC, zero is 273k. "I am interested in an explanation, other than the winds and storms that have been lashing the Norwegian and Greenland Seas and strong winds blowing from the south over the Pole." Again, a novice here, if we include the obvious difficulty that the Kara Sea is exhibiting since early November (alternately growing and shrinking) with the most recent retreat coinciding with the anomally, could this be due to substantial sub-surface warm water flowing in from the Atlantic and preventing ice formation from underneath? The ice thickness display is also interesting with extremely thin ice north of Fram Strait, slightly thicker ice north of Svalbard andd thinner ice again east of Franz Joseph Islands. Might this suggest that there are two subsurface flows from the Atlantic, one through Fram Strait and a second along the northern coast of Asia. This might explain the parallel difficulties occurring in the Kara and Barents Sea. What are SST temperatures in the surrounding areas? 2012 data from Jakobshavn Isbrae show that it has pretty much obliterated all previous speed records. According to the data it was briefly moving at 17000 meters/year in August. Per the authors: "Much of the speedup appears to be a response to the terminus reaching the bottom of a large overdeepening, which may mean slower speeds as the glacier continues to retreat." Though my understanding is that the glacier retreating into the trough would be a very bad thing. Just as last year in January, rain again at Svalbard. 5 year average sl pressures may mislead, if you look at 2010-2011-2012 individually they contradict the 5 year mean lay out. Particularly over the areas you cite. You may not be aware that I am not a fan of AO's, It spans and encapsulates an area too large, while I really like the NAO, smaller is better. altogether. Has its own meaning, I find for instance Greenland not having a SLP high pressure above it very intriguing, since its nowhere near at the altitude of the sea, except for coastal areas. 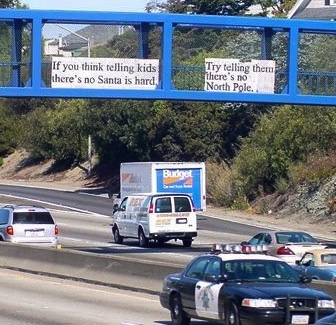 "If you think telling kids there's no Santa is hard... Try telling them there's no North Pole." There is a new paper and article out today on light absorption speeding sea ice melt and affecting first year sea ice as a warm ocean layer that continues to impact refreeze through the winter. Djprice the first link shows the arctic currents, the second the expression of vortices, EKE, with great graphics. Thanks for the info....seems like there are a lot of reasons for this thin ice. I appreciate your help. Anyways these are global sst anomaly's from the same data set Bob Tisdale gets his from. They are very warm for no NINO or even a positive/neatral ENSO. 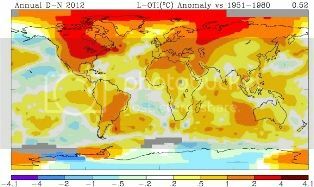 Basically 2013 is going to be a top 5 hottest year on record globally. Thanks for the link to the new Joughin-paper. More graphics to integrate in my CAD representation for Sermeq Kujalleq. It looks like I could employ a small, motivated team to get all the work done that I dedicated myself to. After the June calving (or should I say caving in), the terminus is over the deep (blue) trough (the overdeepening). The question is how deep the ice gets and how far free water reaches under the glacier into the trough. Thanks to A4R too for the new bedrock graphics. I'll be busy with those too. Recent anomalies look warm compared to anomalies in Dec 2011 to Feb 2012 because La Nina lasted til Feb 2012. ENSO will stay neutral for this Winter but I really don't think we have any idea what it will do after May barrier to forecasting. 6 months ago I was fairly certain 2013 would be a top 5 warmest year but things haven't played out as expected. Now we could easily get a year that starts neutral but then goes into a la nina. If that happens, I am not sure a top5 warmest is guaranteed. Having said this, I have just bought a few contracts on intrade for 37 - 40% implied probability. So I do think it is more likely than not. Afaik the Ilulissat glacier still ends in plain Disko bay (see the satellite photo published here on this very blog in September). So, I'm a bit puzzled by the what on the map has been specified as "this fjord". Is it meant as "fjord to be in the near future" or what? Not sure what map you're referring to, Kris, but there would seem to be rather a lot open-water fjord between the calving front and the opening to the bay. Second lowest extent and lowest area. For 'Apocalypse' -- I'm just a reader, not a scientist, but it seems your method for creating images isn't showing the gap in data. It might be more useful to use your page to provide links to sea ice imagery already available from the satellite data providers, rather than generating your own pictures. Those sites that offer both data and images explain how the imagery is generated, note when and how it's validated, and they go back and update the older draft images when the data behind them is corrected. That requires a whole lot of work to keep valid imagery updated. But if you don't revise the imagery as the data is corrected, people can't use your pictures to make comparisons. Each data set (each satellite) has an area that's not covered around the poles. I knew about the polar orbit tracks and why they always miss the poles (planet's turning under the satellite path, satellite is staying at the same position relative to the Earth and Sun) -- so I could easily enough find discussions; people who don't know how polar satellite coverage works will need an explanation to understand why there's a gap in the middle (and a different sized gap for each satellite). 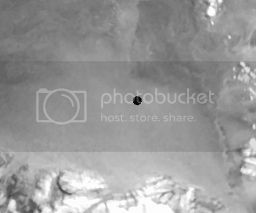 "... Sea ice in the 1984 image has a blockier appearance because that sensor had coarser resolution. The white circle over the pole in each image is a data gap resulting from satellites flying close to—but not directly over—the poles. The wider orbital coverage by AMSR-2 (and other satellite instruments) has shrunk the size of this gap. The area around the North Pole is ice-covered—an assumption confirmed by many airborne and ice-surface expeditions—but researchers use an average of the concentration just outside the gap to estimate the extent within...."
John, The pink dot next to the NP might signify a lack of data, per the legend, rather than open water. Various methods are used to fill in the gap areas that are always missing data around the poles. offers coursework in meteorology online. You have to sign up to get access. It's serious technical study, much of it well beyond me as an amateur reader, but I learn a lot about what I don't know, at least. This is often handy--it's taught me to look stuff up rather than speculate, as my guesses are usually way wrong. I live in Detroit and the last 7 days have been colder than normal. Im worried this may be related to loss of artic ice this summer and am scared the rest of winter will be cold too. Any one hear if this is also a result of loss of ice? Scott, was that you earlier? Hi, scott. A week of relatively colder temperatures is not unusual during winter, anywhere on the planet. However, when weather becomes extremely cold at an unusual time of the year or for a prolonged time, things start to get more interesting. But that still doesn't mean that disappearing Arctic sea ice has anything to do with it. It's very difficult to establish a direct link. But if you get weird event after weird event, you could be looking at an indication of effects linked to what's going on in the Arctic. That's what this 'winter weirdness'-series is for. To document all weird/extreme winter weather that could be influenced by prolonged open waters in some parts of the Arctic, for instance. I'm not sure the current weather in Detroit qualifies though. You'll have to give some more info and tell us how extreme things are. Looking at this temperature anomaly map, I'm seeing around +5 temps around the Great Lakes. 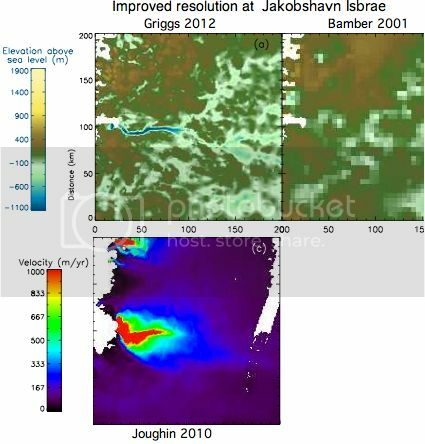 Thanks for all the comments and feedback regarding the NCOF/Godiva anomaly, which has also appeared in the MMAB passive microwave radiation analysis imagery. Donald, thanks for posting the question on the Real Climate site. Hank, thanks for the feedback and comments. I am appreciative that the data may be updated later, but will not be rerunning it. The websites where it is drawn from is posted on the webpages. I also recognize my time commitment (smile). I am not sure this is just a gap in satellite runs, and have emailed a couple of persons at the UK Met that work with the data to determine what kind of anomaly we might be visualising. As something unfolds, I'll comment. 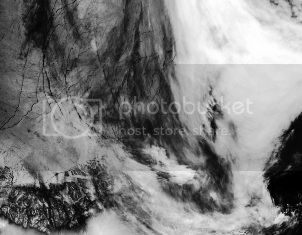 Also, just for continuity, I posted the January 1, 2013 NCOF imagery. I have a new webpage underway for posting 2013 sea ice data. More on that later. I had the latest ASCAT 01012013 on CAD this morning. Although I can’t find any indication on it for open water on the Canadian sector near the Pole, I do think the NCOF imagery reveals some bad news on the quality of what should be second-third year ice now. ASCAT clearly shows the remaining 1,8 Mkm2 ‘safe ice’ as remained at SIE minimum. Within, light grey patterns are visible. An area of about 70K can be defined, slightly darker grey, where NCOF shows its polynia. Could be thin, not very cold ice. Could be severely cracked. Could be little snow cover. You name it. Arctic 1st January parade has been updated. - It appears the Northern coasts of Svalbard always have been free of ice around this time of the year. Thus the Gulf Stream can't be under suspicion of having done weird quirks lately. -SIE seems to have surpassed the 2010 SIE. On the other hand Sea Ica Concentration seems to have hit a new minimum record. btw: a full 35 lines text of me put here this very night has disappeared into the High Nirwana. Also, -5 °C at Station Nord, Greenland. We aren't hallucinating, are we? Thanks for the Parade, Kris. What is quite exceptional is Svalbard circumnavigable (more or less) and 210K ice missing right from the Arctic Basin over there. I can appreciate the witty humor you often pass here, but be careful with assigning phenomena. The Gulf Stream-name is used far to the south. Whether the ocean current over there is or isn't quirky is hard to assess. Multiple causes have weakened the ice, it illustrates the deplorable state of the pack. Right, and it's exactly that what I am saying. Some here were accusing the Gulf stream to act against all physics, but perhaps you missed that. The density of an air mass is a function of its energy. The 2012 sea ice loss was the largest Arctic energy-collection-event in recorded history. The 2012 sea ice loss and energy collection changed the energy content and relative density of large volumes of the Arctic atmosphere. This changed Arctic atmospheric circulation patterns. Cyclones run on heat. A cyclone wanders through the largest Arctic energy collection event in recorded history, and the folks down under assert that the cyclone was not affected by the huge energy event going on around it? Sorry, not plausible. This event was different. Old tools and models were not designed to peer into the maelstrom of large ice loss events. I am not sure what did happen, but we can be very certain that without the 2012 ice melt event, the Great Arctic Cyclone of 2012 would have been very different.
" A cyclone wanders through the largest Arctic energy collection event in recorded history, and the folks down under assert that the cyclone was not affected by the huge energy event going on around it? Sorry, not plausible." Not plausible, what about the data? Don't worry about answering, it's clear this discussion is going nowhere, and I have productive work to do. Granted, using SLP is far from ideal, but it shows the peripheral activity best, where SLP isn't an issue, and the 500mb GPH blocking ridge activity is actually borne out by the SLP over Greenland, regardless of the problems with that metric regards the height of Greenland. Single year events may be significant, but they are weather. 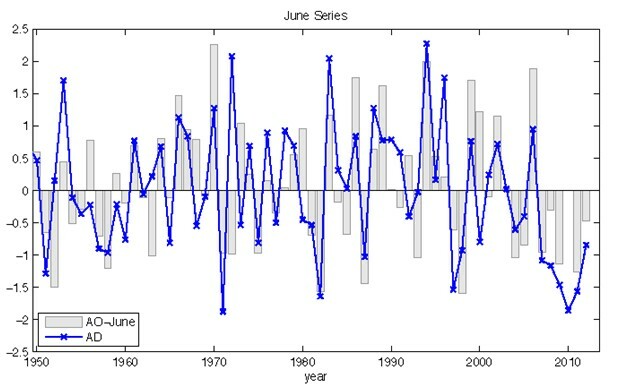 It is the persistence of weather that causes a shift in climate, and it is in the average that such shifts are found. Events like the 2003 Euro heatwave, or the 2010 Russian heatwave are significant. But they are not significant in the way that 2007 and 2010 were significant for the Arctic sea ice, because sea ice has memory in a way that the atmosphere does not. "5 year average sl pressures may mislead, if you look at 2010-2011-2012 individually they contradict the 5 year mean lay out. Particularly over the areas you cite." This is just plain, flat out, wrong! Once you've taken the time to acquaint yourself with that data I'm sure you'll agree that this is a substantial climatic change that makes its strongest appearance in the average, with some years such as 2012 providing textbook examples. 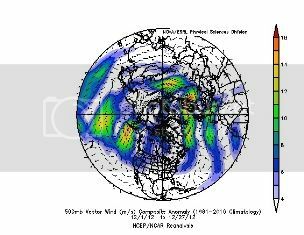 If you are doing work on weather or climate blocking, one site I have found useful is the OSU Polar Met Group. They have a SLP and Air temp wind animation that runs a 3-5 day model. For the last couple of weeks, and into the immediate future, there is a 1040-1047 mb hugh pressure area over the CAB that is drawing those strong winds from Svalbard over the NP. The story north of Greenland is interesting. Looking for clues to the NCOF polynia, I stumbled upon this beautiful AVHRR representation 01012013 of a low crossing into the Wandel Sea from Fram Strait. Werther, this kind of low formation has seemingly been recurring, and this is one example of the low following the airflow around the 1047 mb high pressure in the CAB. In the Bering, there has been many lows following almost the same track from the Sea of Okhtosk into the Gulf of Alaska, some as low as 950 mb. Ice in the Bering is going to get thrashed often IMO, if this pattern continues. The dominant feature is the Polar high on the Russian side of CAB that has not moved for over 10 days. It is an interesting winter for the ice. METOP 2 IASI CH4 for 2013. Some data still needs added, and my priority will be Arctic methane for the time being. Many thanks to those who have contributed to my learning about all things Arctic on this site. Some of you are very good teachers! I hope these efforts will be of value to this community. Do have a look at the ecmwf 14 January forecast. In the middle of the Atlantic quasi subtropical air would be squeezed between a depression over Greenland and an anti-cyclone over Europe, straight into the Barentz Sea. Almost exactly the same pattern which triggered last year the startling 7° C max temperature record at Svalbard. Talking about anomaly time, it ain't finished yet. "The hole is not real - it is due to a combination of a gap in the satellite cover and a modelling problem. The model should be able to cope with the satellite gap, but is not doing this as well as it should. We are making a change later this month to rectify the problem, and the hole will no longer be present." Thanks again for the comments from the group on this issue. We can now focus on the real anomalies at hand! On Friday, Tasmania experienced its peak temperature since records began with levels hitting 41.8C. The national weather bureau has warned extremely hot conditions are expected across much of the country next week. Hope all is well for friend of the blog Phil263 and family. Another Chinese article links the cold snap to melting Arctic sea ice. If it's any consolation to them Neven, eventually the cold air falling off the Arctic in Winter will become warmer than their current low records in China.